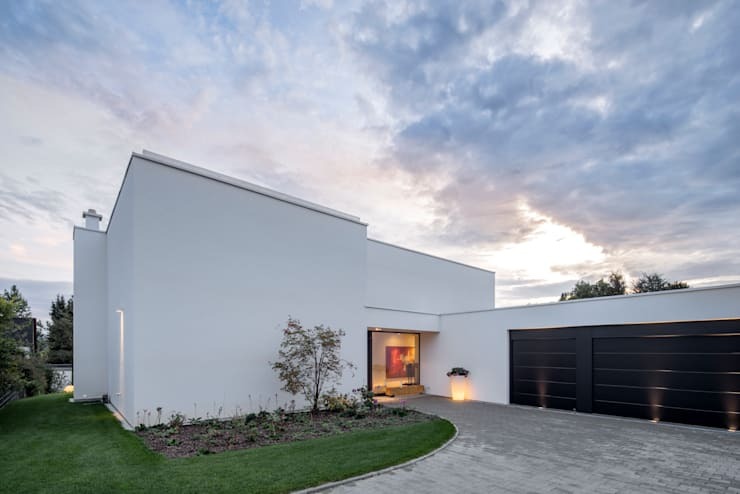 Designed by Schiller Architects BDA, who are based in Germany, this is a home that utilises the most simple of materials to create the most extraordinary results. It's also not the first time that the architects have gotten it so right! Their darker wooden house and white, concrete home are just as impressive! This home, however, is one of our favourites. Glass is a common material used throughout, providing expansive views from every single room in the house. Combined with stylish twists and colourful décor items, this is a home that is fit for anyone who likes a bit of trend, a bit of style and a bit of beauty. And the experts here at homify can confirm that if you live in a beautiful, South African city, this is the type of home that you want! Providing beautiful views of whatever city or ocean your home looks onto, this is a style to watch. Doesn't your mouth just drop open at the first sight of this gorgeous home? Glass extends across the entire front of the exterior, on each level, opening the entire home up so that there is a very simple and transparent transition between the interior and the exterior. How chic and trendy is this? As impressive as it looks, this is actually an incredibly simple design where the architects have utilised glass and brick. Less is more! They have then designed the home so that it forms a slight alcove, placing an outdoor patio perpendicular to the house itself so that it makes an L-shape. This means that despite the fact that the windows reveal to the world the on-goings of the interior, there is still privacy and a sense of coziness. The L-shape gives way to a beautiful garden and lawn area—fantastic for the kids! If you have the opportunity to include a great lawn area on your property, go for it. It will mean more space for your kids to play outside rather than sit in front of the TV. It will also be fantastic when you're hosting braai's or pool parties. Moving into the dining room area of the home, it's clear to see that the use of white transitions from the exterior into the interior. White walls are a dominant feature throughout the home. However, the designers have softened this stark, white look with some beautiful warm features. The soft wooden floors create a honey-like effect throughout the living space, while dark chocolate chairs and a wooden dining room table feature, creating a very modern and stylish look and feel. The fireplace is an amazing addition to this home. With the high ceilings and wooden floors, the room may get cold in winter. However, the glass works as a natural insulator as the fireplace warms up the entire area. Have a look through this awesome range of fireplaces for your own living area! 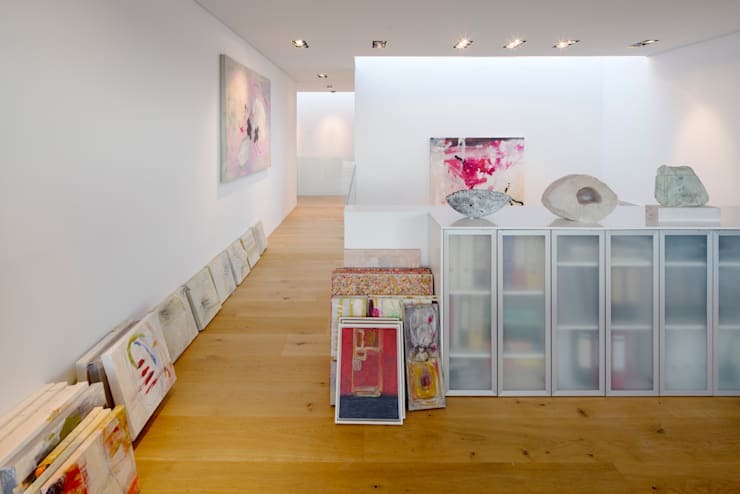 Artwork also plays an impressive role in this space, adding colour, life and style to the room. The study/office area is an artist's paradise and in this house, serves as a room of creativity and colour! Artwork lines the walls and floors here, possibly ready to be transported to a gallery or even straight to the home of a fan of this artist! Abstract shapes and wisps of colour are a theme throughout these paintings and each piece would look glorious in any space in this home. Why? Because the white walls and the wooden floors create the perfect platform for any colours or styles to take shape. You'll also notice that while artwork takes up space here, there are no paint brushes, canvases or bottles of paint littering the area. Smart storage is key here, even for a creative! The storage unit in the corner of the room allows for bits and pieces to be locked away, out of sight. This means a much neater and more minimalist room! More more inspiration, check out these: Alternative Clothes Storage Ideas For Those Without A Closet. A plunge pool features on the glorious deck of this spectacular home, allowing for late night swims or early morning games in the pool! The deck is a simple, light wood and is adorned with a simple, wooden deck chair. Can't you just picture yourself with your feet up here, reading your book? Lighting is also a prominent feature throughout the exterior, which is really important for this type of space. It illuminates different parts of the wall around the entire deck area, creating ambiance and mood. This is the spot where you want to be when you're proposing to your wife or having a romantic dinner for two for your husband! You can also see the interior space through the glass windows here, where the kitchen, living area and bedroom space opens out onto the deck area. You can open the doors up in summer and have the most amazing party! If we go around this side of the house, we can see how the architects have thought every detail through, creating a compact and clever design. A little square of glass gives us a hint as to the impressive use of it throughout the rest of the house. There are three garage spaces here as well—a great tip if you have a big family. This provides the perfect storage space for cars, bicycles, scooters or even a boat! The garden has also been perfectly manicured on this side of the house, creating a very impressive entrance for visitors to the home! Every single detail has been thought through—this is the type of home that you want no matter where you live and how big your family is! If you liked this home, we know you'll love: The Sparkling Family Home.